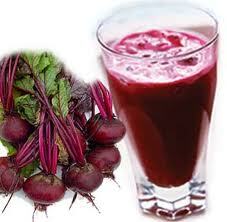 Beetroot Juice Is Linked To Brain and Heart Health. Studies suggest that in addition to heart health beetroot juice increases blood flow to brain and therefore joins the fight against dementia. Biology and Chemistry, scientists at Wake Forest University in the US decided to explore the potential impact that beetroot juice could have on brain health. 1. tends to decrease blood pressure. 2. Increases Brain blood perfusion. cognitive health (thinking ability) and poorer blood flow in elderly is related to dementia (loss of memory). Therefore drinking beetroot juice eradicates the risk of dementia in old age to great extent. Beetroot juice has high nitrate content. Nitrates cause vassodilation (relax the walls of blood vessels and increase their lumen) . It means they tend to decrease blood pressure and tend to increase blood flow. e.g glyceryl tri-nitrate is a well known medicine used in angina and hypertension. To do so they took a group of 14 adults aged 70 or over and for two days and fed half of them a high nitrate breakfast that included 16 ounces of beetroot juice while the other half ate a low nitrate breakfast. After that an MRI scan was taken before the two groups swapped breakfasts for two days before having another scan. The MRI scans revealed that blood flow to the white matter of the frontal lobes, an area commonly associated with dementia, was higher among those who had just had the high nitrate breakfast. On the back of recent research into the heart and stamina benefits of beetroot juice, it has begun to see its share of the market grow. In the UK, the supermarket Waitrose revealed last month that sales had grown 82 per cent over the past year, while bunched and prepared beetroot sales were also gone up 15 and 22 per cent respectively. For fitness and health water is also one of the main best option to keep water safe in home our company provide you water bottle,water cooler, and also for your baby there is baby water bottle for detail visit our site. Thanks for the sharing and helpful informative you have Dr. Adil... I really like your article. Growning up I always knew beets were good for you, but I had no idea all of the benefits of the beet root, thanks for sharing this valuable and interesting information!